The TPC transaction processing benchmarks (TPC-C and TPC-E) used to be a more prominent part of database discussions, but this has diminished for several reasons. One, Intel has clearly won the processor competition with niche segments to POWER7 and SPARC T3 (SPARC T5 as of 2013-Sep). Second, Microsoft moved to the newer TPC-E benchmark while Oracle stayed with the older TPC-C, which is more amenable to scale-up hardware configuration (RAC) while TPC-E is not. A third reason is that in recent years, hardware has become so powerful that system performance-capability is no longer a serious concern for most situations. Still, there are useful observations that can be drawn from the limited number of results being reported. 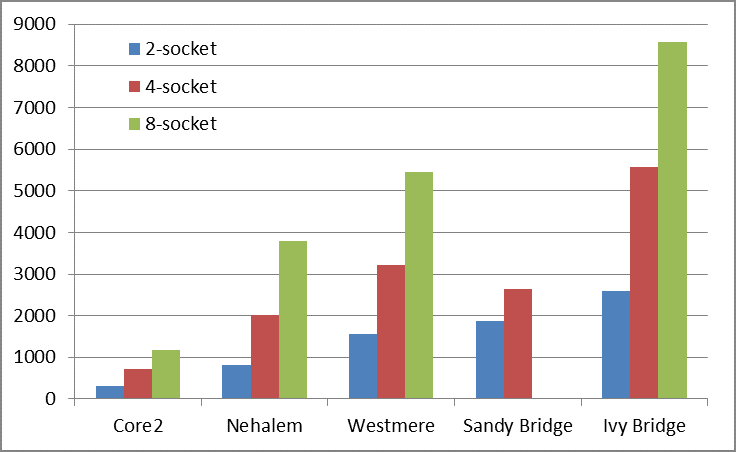 One example is the progression over time for 2, 4 and 8-socket systems from Nehalem, Westmere, Sandy Bridge (2 & 4 socket only) to Ivy-Bridge processors (there was no Sandy Bridge E7). 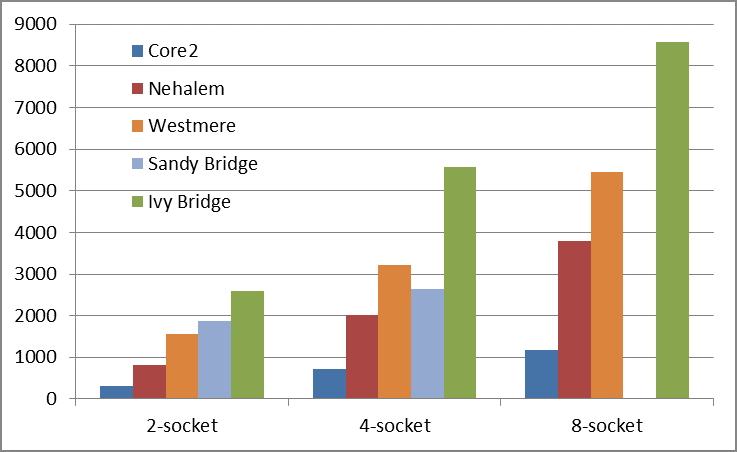 The charts below show the progression of performance over time for the selected TPC-E results spanning Core 2, Nehalem, Sandy Bridge and Ivy processors at 2, 4 and 8 sockets. For the 2-socket systems, West-1 is from the first set of TPC-E results reported for Westmere X5680 with HDD storage and West-2 is the later X5690 report with SSD storage. Both are 6-core Westmere-EP processors. The West-3 is the E7-2870 10-core (Westmere-EX) on SSD storage. For the 4-socket systems, West-1 is on HDD storage, and West-2 on SSD, both 2K8R2 and 1TB memory. The West-3 is on Win/SQL 2012, 2TB memory and SSD storage. The same data is shown below with reverse organization showing scaling with sockets for each of the processor architectures. At the 8-way level, between the first Nehalem-EX to the most recent Westmere-EX results, performance has increased 73% from 3141 to 5457 tpsE. The contribution for raw compute capability is 32% (8 to 10 cores per socket, and 2.27GHz to 2.4GHz). Some of the gain can be attributed to memory, from 1TB to 4TB, the switch from HDD to SSD reducing the number of transactions in flight, and some to NUMA improvements between SQL Server 2008 R2 to 2012 engine. But there is still a significant portion that can be attributed to just learning how to configure a system with so very many processor cores to support high transaction volume. There was no E7 version of the Sandy-Bridge processor. For Ivy-Bridge, the number of cores increased to 15 from 10 in Westmere and frequency increased from 2.4 to 2.8GHz. 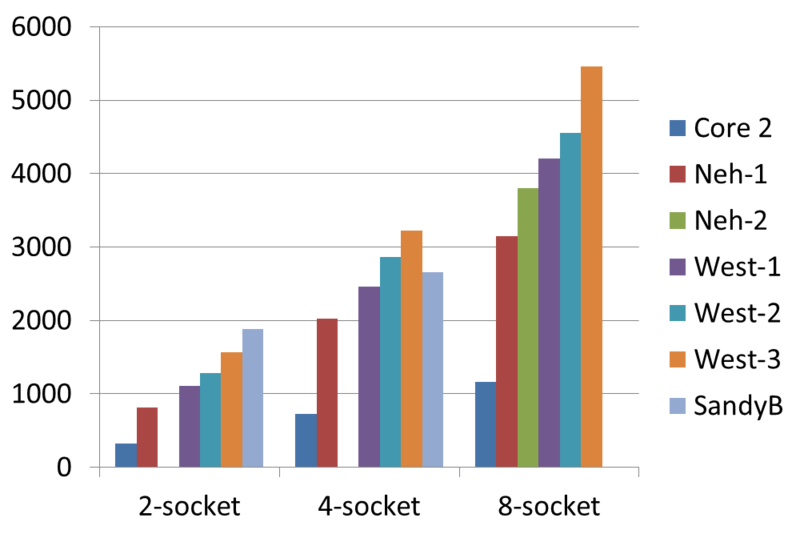 The combined compute cycle gaing from 50% in cores and 16.7% in frequency is 1.75, not accounting for differences in the core architecture. The realized gain in tps-E from 8-socket Westmere-EX to Ivy-Bridge is 1.573. This is one indicator of the difficulty in scaling performance at the high end. Also interesting are the three TPC-E results on 2-socket E5-2690 system and SQL Server 2012. All use SSD storage and have very similar performance. IBM posted the first result of 1,863 tpsE on 6 Mar 2012. Fujitsu followed with 1,872 on 5 Jul 2012. HP posted last with 1,882 on 20 Nov 2012 for their DL380p Gen8. The IBM and Fujitsu configured 512GB memory, with 16 x 32GB DIMMs. The inteesting aspect is that HP employed 256GB with 16 x 16GB DIMMs. Today, the 16GB registered ECC DIMM is $210 from Crucial, and $1,349 for the 32GB DIMM. I am inclined to speculate that the performance difference between 256GB and 512GB might be a few percentage points, all thing being equal and on a powerful storage system. IBM just posted a new 8-way Xeon E7-8870 (Westmere-EX) result. The new result does use a whopping 4TB memory versus a mere 2TB in the earlier Westmere-EX results. The first 8-way E7 did not show good scaling, so presumably there was some problem that took time to resolve. Below is the history of 8-way results for Nehalem and Westmere EX. The IBM 2013/3 result is on Win 2012, the earlier results are on W2K8 R2 SP1. Compare this with 4-socket systems on Nehalem-EX, Westmere-EX and Sandy Bridge EP. Notice that in the progression from 2x10 Westmere-EX on SQL 2K8R2 to 2x8 Sandy Bridge EP on SQL 2012, performance increases even though memory decreases from 512G to 256GB. From 4x10 Westmere-EX to 4x8 Sandy Bridge EP, performance decreases relative to both of the more recent Westmere-EX results. The charts below show the progression of performance over time for the some of results above. For the 8-socket systems, Neh-1 is on HDD storage and Neh-2 is the later result on SSD storage. 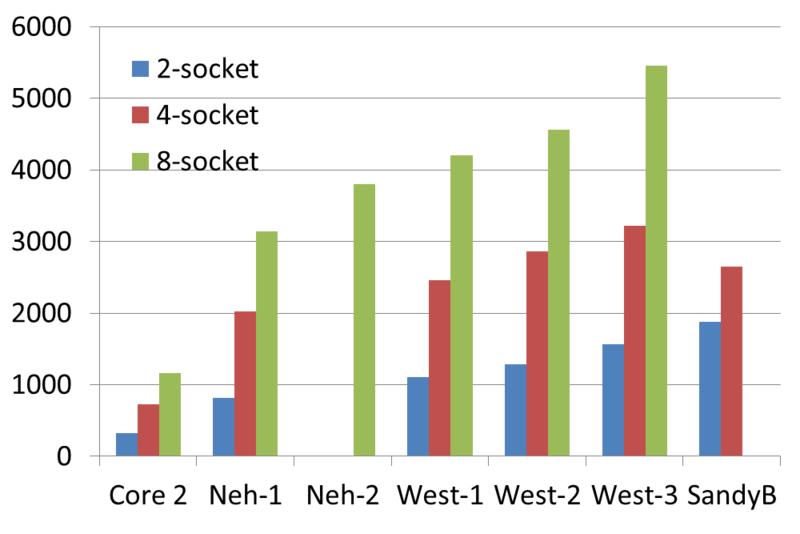 West-1 is the initial 2011-04 NEC report, West-2 is the 2011-06 Fujitsu report and West-3 is the IBM 2013-03 report with SQL 2012. Below are max response times for the three recent 8-way systems. Between the 2011-08 and 2013-03 IBM reports, there was a good reduction in average response times, but a dramatic reduction in maximum response times. Only Security-Detail did not experience a reduction in max response time. Intel officially announced the Xeon E5 2600 series processor based on the Sandy Bridge-EP core, upto 8 cores and 20MB LLC per socket. Only one TPC benchmark accompanied product launch, summary below. The Xeon E5 superceeds 2-socket systems based on both the Xeon 5600 (Westmere-EP) and Xeon E7 (Westmere-EX). It is evident that Sandy Bridge improves performance over Westmere at both the socket and core and also on a GHz basis. A later version of the Xeon E5 will support 4-socket systems. There is no explanation as to whether glue-less 8-socket systems will be supported in the future. It was previously discussed that there would a EN variant of Sandy Bridge with 3 memory channels and fewer PCI-E lanes. The initial TPC-E results for 2-way Xeon 5680 systems with HDD storage were around 1,100 tps-E. Later Fujitsu achieved 1,246 with SSD storage. The 2011 HP result with the Xeon 5690 is of note in the use of the Violin SSD storage system. IO 6 SAS 6 SAS 5 SAS 5 SAS ? Enclosures 24 MD1220 24 MSA70 24 D2700 5? 2? Most if not all TPC-E reports employ RAID-5 for data, and RAID-10 for logs. The storage enclosures and number of disks in the above tables here are for data only? The Fujitsu system, the 5 disk enclosures (24 x 2.5in SAS/SATA) are $2,611 each, and $13,056 for quantity 5. The 64GB SATA SSD is $1,131 each and $135,762 for quantity 120. The total storage cost is $151,300 including rack, but not including HDDs in the server itself. The HP DL380 with Xeon 5690, the Violin storage system is $100,500 each, and $201,000 for quantity 2. By contrast, the 528 disks in the HP DL380 G7 result cost structure is $3,199 per enclosure at quantity 24 for $76,776 li, and $349 per 15K 72GB HDD for $184,272, with total $261,000, excluding spares. Below are the average response times for the 10 TPC-E transactions, along with the weight of the transaction and the number of frames in each transaction. The transactions in flight is calculated as the (transactions per sec) x (1/0.101) x (average response time) The seconds term is the inverse of fraction trade-orders. For each trade-order, there are just less than 10 transactions, some of which have multiple frames, even though only the trade-order is scored. The total transaction volume per seconds times the average response time (in seconds) is the average number of active transactions in flight. In theory, having a lower number of transactions in flight at any given point in time should reduce contention, with moderately improved performance. The table below is the maximum response time for each transaction. It expected that as the system is pushed towards 100%, the maximum response time should increase sharply. Below are the 4 TPC-E results for 4-way Xeon 7560 systems. The IBM and HP systems are very similar, with the same memory and type of storage, and the results are within 1% of each other. The Dell result is 3.5% lower than the HP result and 4.5% lower than the IBM, which can probably be attributed to the difference in memory, 512GB versus 1TB. IBM 6 ServerRAID-M5025 controllers, 84x12 disks, 42x24, 6x7x24=1008, 7 sets of 24 disks in RAID-10. Dell 6 PERC H800, 2 LSI MegaRAID SAS 9280-8e, 24 MD1220, 20 MD1120. HP 10 Smart Array P411, 40 StorageWorks D2700. The Dell system 64x8GB DIMMs cost $32,000, while the 64x16GB DIMMs in the HP system costs $92,736. Some care should be taken in assessing whether the performance gain justifies the higher cost of 16GB DIMMs. The Fujitsu system has the same 512GB memory as in the Dell, with SSD replacing HDD storage, for a 5.8% performance gain. The performance advantage over the IBM and HP with 1TB memory, but HDD storage, is 1-2%. The Fujitsu system with SSD storage has significantly lower average response time on Trade-Lookup and Trade-Update compared with HDD, but curiously slightly higher response time on Trade-Order and Trade-Result. The Dell system has the longest average response time (weighted over all calls) as expected with less memory, but not the SSD storage in the Fujitsu system. Below are the 8 TPC-E results for 8-way Xeon systems. The tps-E score is the number of Trade-Order transactions completed per second. The weighted average response time is the sum of the average response time of the individual transactions weighted by the percentage weight. Note that the transaction volume is approximately 10 times the tps-E score (1 over 10.1%). However, the weighted average number of frames per transaction is 2.213. So the volume of stored procedure (RPC) calls (as reported by the performance counter SQL Statistics -> Batch Requests/sec) is approximately 22 times the tps-E score. A frame is implemented as its own stored procedure. In a transaction, each frame is called separately in sequence (?). A note of caution in comparing Xeon 5500 series with Xeon 7300/7400 and Opteron processors. The higher-end Xeon 5500 have Hyper-Threading feature which probably make substantial improvements to TPC-C and TPC-E results. The HT feature does not benefit all SQL operations evenly. Still, the 2-way Xeon 5570 is very impressive compared to all the most recent 4-way systems, even the 24-core Xeon 7460.